Marketplace of savings and investments for Latin America, we connect people with financial institutions through auctions, profiling and differentiated products. Problem: Lack of financial education for investors, poor digital presence of financial institutions and knowledge of few investment products. Solution: Marketplace of savings and investments for Latin America. Market: Bankarized people looking for making their money profitable. They use Internet, search engines and social networks. Also, they are looking for transparency and immediacy. Market size: Peru (US$ 26B: 800K saving accounts) and Mexico (US$ 81B: 3,700K saving accounts). Competitive Advantage: Own software and developed in-house. Web and responsive technology for smartphones, generation system, activation and auction adjudication are automatics and cross notifications for users and affiliated financial institutions. Also, we are multidisciplinary team with three relevant specialties for a Fintech: finance, technology and marketing. IF you have any question about the Lima contest , Please contact the following partner. César is Technology Director at everis. Professional with more than thirteen years of experience in the field of technology consulting, always related to the field of Digital Channels, Mobility, Omnichannel, Architectures and Systems Integration, API Management, DevOps, BI and BigData and other projects related to the Digital transformation of large organizations. Computer Engineer from the University of León and during his career he has developed projects in large organizations of telecommunications, financial entities, public sector, insurance and public services in different countries (Spain, Argentina, Chile, Peru). Professional with over fifteen years of experience in exponential technologies with a PhD in Agile strategies at the University of Alcalá. It has developed agile transformation strategies for different companies in Spain and Peru. 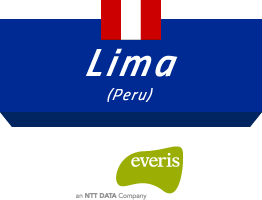 Currently is a ITS&S Director in everis Perú. Telecommunications Engineer and Bachelor of Business and Administration. His professional career of more than 25 years, has always been linked to the world of consulting. Between 2003 and 2007, he moved to Brazil to become the everis CEO in that country. From 2007 to 2018, he held the positions of world leader in the telecommunications sector and responsible for the development of the IoT business in everis. He is currently Vice President of Operations and Production at everis Peru.